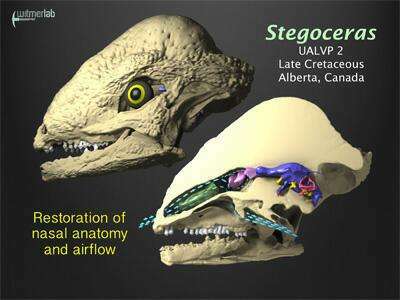 It's been millions of years since T. rex took its last breath, but a team led by Ohio University scientists is breathing life back into dinosaurs using high-powered computer simulations to model airflow through dinosaur snouts. The research has important implications for how dinosaurs used their noses to not only breathe but to enhance the sense of smell and cool their brains. To restore what time had stripped away, the team turned to the modern-day relatives of dinosaurs—birds, crocodiles and lizards—to provide clues. "We'll do whatever it takes," said Lawrence Witmer, professor in the Ohio University Heritage College of Osteopathic Medicine and principal investigator on the National Science Foundation's Visible Interactive Dinosaur Project, which funded much of the research. "We did lots of dissections, blood-vessel injections and CT scanning, but a major new tool was 3D computer simulation of airflow." The dinosaurs that best fit the bill were the pachycephalosaurs, or "pachys," a group of plant-eating dinosaurs best known for the several-inch-thick bone on the tops of their skulls which is thought to have served both as a visual display and as protection for head-butting behaviors like those of modern-day rams. It turns out that building all that extra skull bone resulted in ossifying soft tissues in other areas of the body—such as the nose. noses enhance smelling? who woulda thought!. excellent science!